The 41 Magnum was developed in 1964 by Remington mostly for large frame revolvers in law enforcement and hunting use. 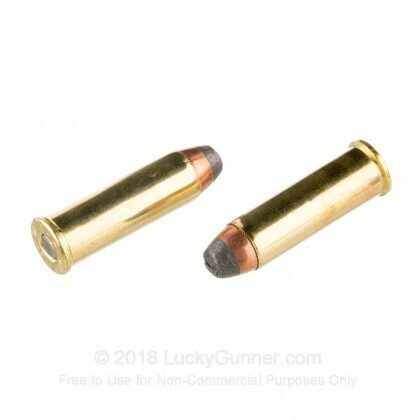 Whether you are looking for a great round to defend yourself with or like challenge of taking down big game with a handgun, the 41 Magnum is just the powerful round for you. Founded two hundred years ago, Remington is the oldest ammunition and firearms manufacturer in America and is perfect for all your shooting needs, whether you want something top of the line or something inexpensive. 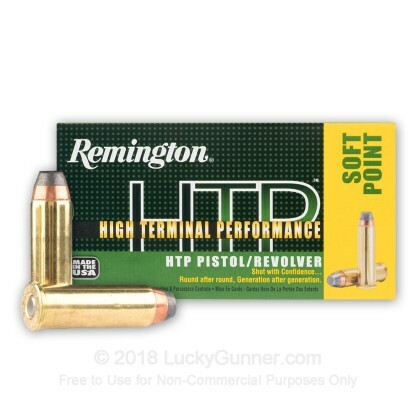 These Remington HTP, semi-jacketed soft point, 210 grain, boxer primed, brass cased rounds fire with incredible speed, hit with amazing terminal expansion, and have fantastic penetration, helping you take out deer and boar with ease. I have bought 6 boxes of this stuff to date. Two boxes slipped through QC. The bullets were set too deep and were not crimped. I sent an email with pictures and the great customer service of Lucky Gunner replaced them at no cost. These are stout loads. I ran a group of five rounds through my 4 5/8" Ruger Blackhawk over the Chrony and averaged 1776 fps. Yes, you read that right. And it's more accurate than I can be. You won't be disappointed with this round. Did I mention that it's a stout load? 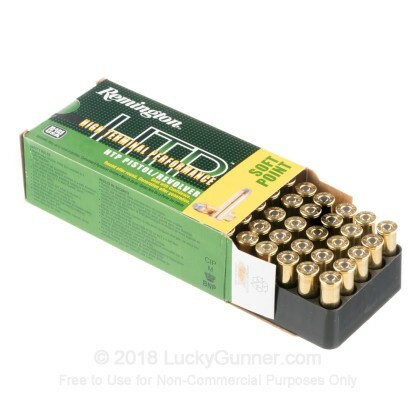 I am a reloader, and I rarely purchase commercial brands of ammo. 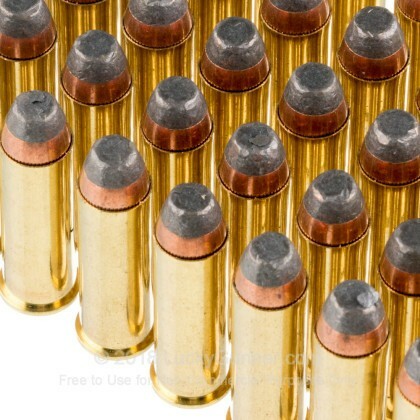 But, when it comes to quality components, and serious stopping power, I always choose Remington's HTP brand ammo. The price isn't bad for a 50rd box. The quality is among the best on the market. I use it in .45colt, and .41 mag. 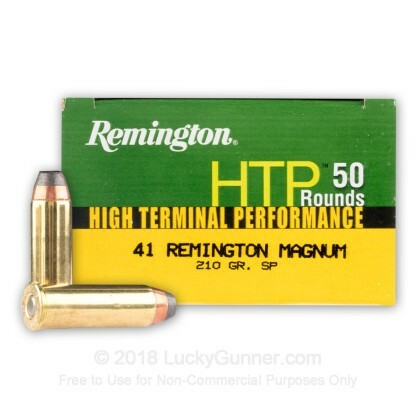 I have never had a bad round with any round in HTP, and I highly recommend buying a box, when you find them in your favorite caliber! The best stopping power that you can find for the money! 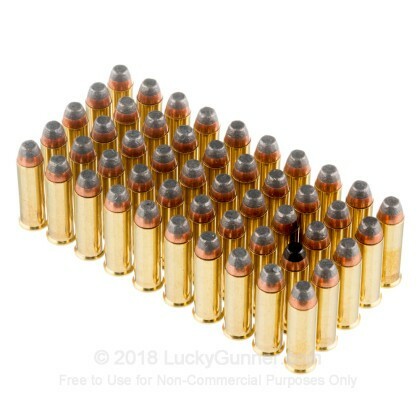 One of the few factory .41 Mag loads. I agree with everything in Eric's review. It is a good load but a little snappy when it comes to the recoil. It is my daily carry load in my S&W Model 58. I have taken feral pig with it in the past and it worked great. But as a self defense load you will need to spend some time and effort to get used to it. I had my revolver Mag-Na-Ported and that helped a lot with the muzzle flip. This was one of the two original 41 Magnum rounds introduced by Remington. The other loading was a reduced velocity version using a lead bullet. The Remington 41 Mag 210 JSP still is a potent round, the same as the initial version over 50 yrs ago. A: Hello Marcus! Remington lists the muzzle velocity at 1300 fps with a muzzle energy of 788 ft. lbs.